This recipe intrigued me, and then when I was cooking it I was slightly worried about the flavours. I was concerned it would be a bit bland and tasteless. Most of all I’ve never eaten raw zucchini that I can think of and wasn’t sure that I wanted to start now. I’m happy to say that the worry was all for naught This is beautifully light, nutty and fresh recipe. 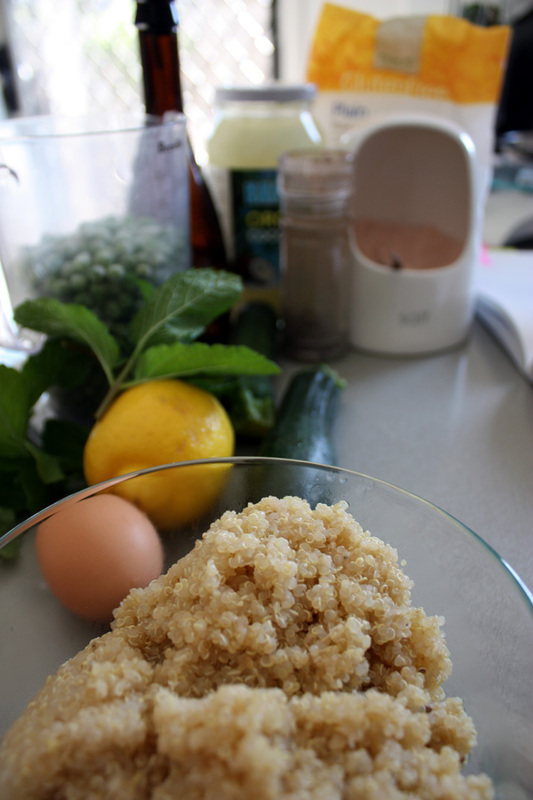 The mint and lemon are a lovely flavour combination with the fresh pea’s and it all works very well with the quinoa. 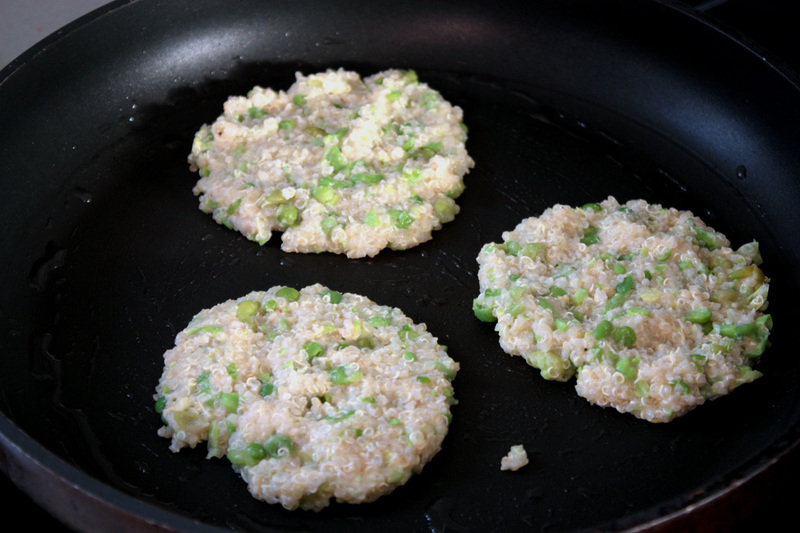 The fritters were filling enough to be an evening meal on a warm spring night, but would be equally as good for lunch. The zucchini salad was fresh and the raw zucchini was crunchy and a great texture base, whilst the pea and mint flavours were the dominant feature. We didn’t love this recipe, but we were both satisfied with our meal and dare I say it, probably prepared to give it another go if the opportunity presented itself. 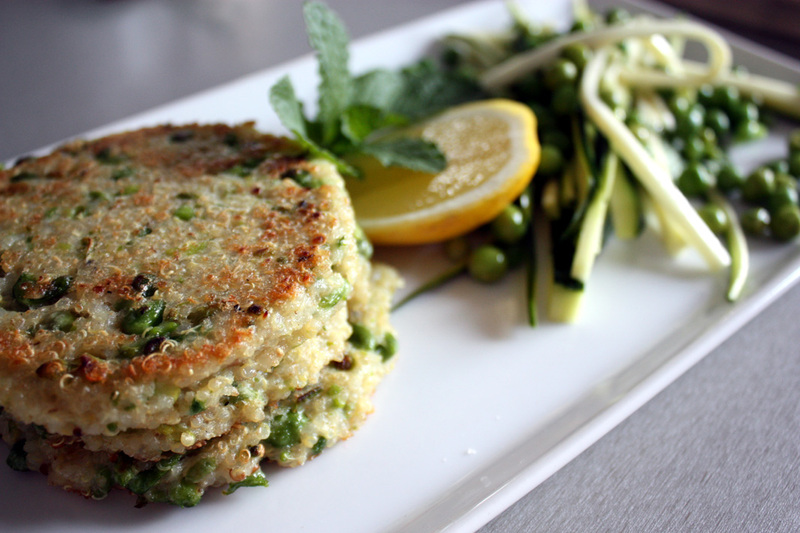 Another good vegetarian recipe to add to the list from Donna Hay. 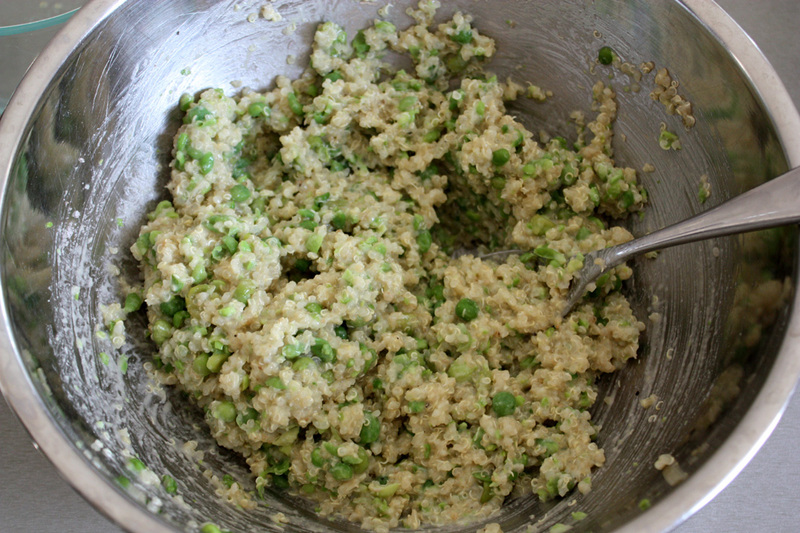 Roughly mash half the peas and place in a bowl with the quinoa, egg white, rice flour, oil, salt and pepper and mix well to combine. Shape 1/2 cupfuls of the mixture into thin patties. Heat the extra oil in a large non-stick frying pan over a medium heat and cook, in batches, for about 3-4 minutes until the patties are golden brown on each side. Dry on absorbent towel and serve with the zucchini salad. To make the salad, prepare the zucchini and mix all the ingredients in a bowl together. This recipe recommends serving it with labna, but I think it would be equally good with some persian feta or try some poached chicken like we did and turn the whole dish into a meal. Thank you! let me know you go with them, would love to hear what you think. How gorgeous are those? I just had to pin that photo! I’m making these tonight… I seem to have everything I need. And I love raw zucchini! I made these over the weekend Leah and they were scrumptious! Not as pretty as yours, mind you. But just as yummy, I’m sure. I made them and they fell apart while cooking, so I added another egg white, still fell apart, so I added a third whole egg and only then did they mostly stay together. I’ll be halving the mixture and using extra eggs next time.